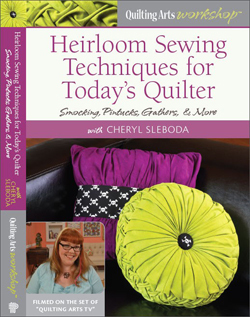 Technique of the Week #3 – Painted Fusible Web – Cheryl Sleboda – Textiles. Technology. Texture. Teacher. This technique I had heard about on Quilting Arts TV. Pokey Bolton does a quick demonstration of it on the show, but I got more information about this technique in Jane Davila’s and Elin Waterston’s book Art Quilts At Play. The texture of the WonderUnder is visible in this technique and I don’t know of any fusible that is completely smooth, so this technique will always have some element of surprise. I was pleased that my koi fish came out looking like it had scales on it. I also realized once I was finished that I could not iron the image after removing the backing paper… It would stick to your iron. That said, this was an easy, quick, and fun technique. 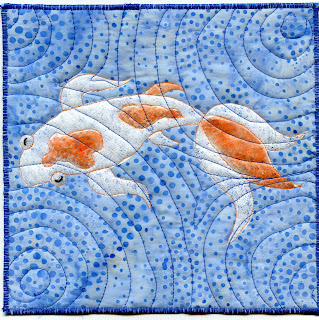 I am going ona quilt retreat this upcoming weekend, so it should be lots of fun to get my sewing groove on for 3 days uninterrupted.